When it comes to Facebook marketing, you can pay attention to two metrics in order to determine how effective your content is: the engagement rate and the People Talking About This rating. By using these engagement metrics, you can determine whether the content you are posting is working, and you can compare the quality of different posts. The other metric you can look at is the People Talking About This rating. Basically a buzz metric, this rating measures who is talking about you and your posts. This metric can be found right below your page name, as shown in the figure below. The People Talking About This metric. To boost these metrics, businesses need to make sure they are posting on a consistent basis and engaging in a dialogue with their followers. Visual content is critical to engagement on social channels. Because Facebook’s News Feed is highly visual, businesses need to develop enticing images that their fans can Like and engage with. Images also bring your lead-generation call-to-actions (CTAs) to life and encourage more clicks. In fact, a recent HubSpot study found that photos on Facebook received 53 percent more Likes than the average post and 104 percent more comments. And to make it even more compelling for lead-generation enthusiasts, posts with an image received 84 percent more clicks than text-only posts. So what sort of imagery can you use? 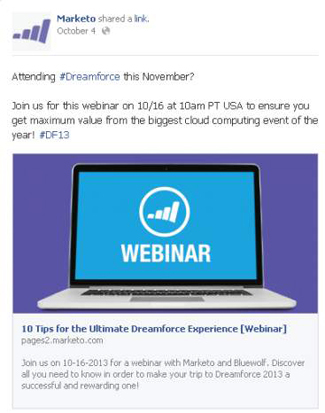 Consider promoting a webinar with a custom image, like in this image below. However, you must make sure that you follow Facebook’s imagery rules if you want to promote these posts, which is a must for lead generation. According to Facebook’s Help Center, “Images in your ads and sponsored stories may not include more than 20 percent text in the image.” Facebook believes that images with less text are more engaging for its audience. After you upload your image, it appears within the 5 x 5 grid. Click the boxes that contain text. If text is present in six or more boxes, the image has more than 20 percent text and is not eligible to be used in an ad in News Feed. If your image has more than 20 percent text, adjust your image. 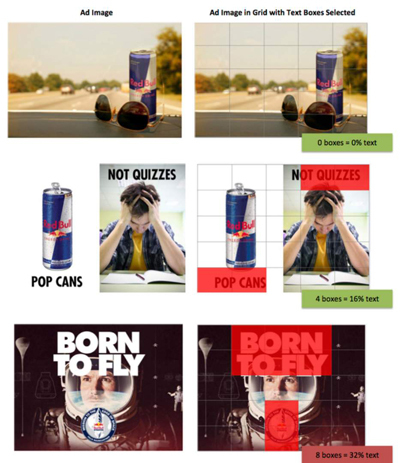 The following figure illustrates this rule so you can see how this works for ads without text, ads with the right amount of text, and ads with too much text.